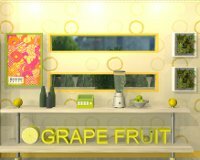 Fruit Kitchens No.9: Grapefruit Yellow - Let's begin with a little FunkyLand. That's what she said. No, really, though: FunkyLand's series of find-the-somethings-sweet-and-colorful is always always the perfect escaping warm-up, stretching mental muscles just to the slightest while charming the funk out of you. This time out you're looking for 7 yellow grapefruits, some hidden in plain sight, others secured behind a coded puzzle. Since the uber whimsy of these kitchens would make any chef green with envy (Envy Green is an episode yet to be released), we can almost forget we're meant to be leaving. Escape from the Three Colored Diamonds Room - Keeping pretty much with their standard formula for escape game design, Yomino Kagura still manages to produce a neatly logical escaping experience, albeit perhaps a little too easy this go around. A changing cursor helps you find active areas and, even though it's without an English translation, navigation and exploration remains intuitive enough that language knowledge isn't needed. This is purely about puzzles—just enough to keep you thinking without spoiling the relaxing vibe of being locked in a room, forced to scramble about finding clues and hidden tools to procure your freedom. White Night - by Sneedle tends more toward point-and-click adventure than escape the room game. It even has a cameo appearance from a star of the Reisen series. Although made in collaboration with No1Game, don't bother looking for any little green men. Instead, you're tasked with solving a series of puzzles in order to find you way out of this strange world. Knowing to look out for quirks, including a few pixel hunts and less-than-intuitive actions, will help you complete your quest without frustration. Despite those downsides, or maybe because of them, the quaint artwork and creative environment make this adventure a charmer. Weekday Escape N°33 Walkthrough now available! On the table, right of the jug. Use the can on the glass on the table, note the number code. Use the wire cutters on the middle cabinet. Take the stick and the circle. Use the stick under the couch to get the blue button. Go back outside and click just to the left of the base of the tree. Get the key. Go into the cafe (the red building with the awning). Note the arrangement of items on the display case. Click just underneath the display case and get the mouse and the glass. Zoom all the way out and go right. Get the gear from the vendor's cart (the left wheel). Go right. Get the black thing hanging from the dragon's tail. This item will hereinafter be referred to as "the pronged thingy" (it's a technical term). Go back to the graveyard view. Use the key on the house behind the gravestones. Put the gear into the obvious spot. Click the panel on the wall and put the pronged thingy into the holes. Zoom out and fill the glass with water. Reclaim the pronged thingy, then go back to the graveyard. Click just to the left of the leftmost gravestone. Water the plant. Get the bone. Zoom out and give the dog the bone. Follow him to the right. Click the dog to get his leash. Use "about item" on the bow & arrow, then use the leash on it. Shoot the arrow at the dragon in the pattern indicated by the display case in the cafe. Whoa Nelly fire! Go left, then right again. Get the red baseball from the top of the now-charred tree. Poor tree. Click the panel the receptionist was obscuring. Use your pronged thingy on the holes. Zoom out and note the diagram that appeared on the wall. Go outside and throw the red ball at the window indicated by the diagram. 2nd floor of the hotel (or 1st floor for you European types), rightmost window. As requested, this is more solution-explicit. Also, colorblind help is provided. Aside from the obvious door, the only thing here is a table with a drawer that needs a three-digit code. The numbers of the code are green, which might be significant. There's something under the couch, but you can't reach it. On the small shelf, there's a picture of stars on top, and the titular three diamonds on the shelves. On the picture, there are three red stars, two yellow ones, and one blue one. The diamonds are yellow, blue, and yellow. There's a round table with a checkerboard box. The box has slots for three shapes (circle, square, triangle). There's a wobbly picture on the wall with a picture of an eighth note. The left doors are missing a button (probably a blue one, knowing this game designer), and there's a star and some numbers. The middle doors are wired shut. The code is the LOI in the right-hand cabinet, but it's not the right way up. LOI turned upside-down becomes 107. Enter the code and get the wire cutters. Use the wire cutters to open the doors. Get the stick and the shape (red circle). Use the stick to get the item you couldn't reach before. It's a blue cube. The blue cube is the missing button; put it in place. The code is written right on the doors, but you have to translate it first using the picture on top of the shelves. 3 means red, 2 means yellow, and 1 means blue. Colorblind help: middle, right, left, right, left, middle. Get the shape (blue square) and note the notes. Uh, I mean notice the notices. Wait, that didn't come out right either. Lemme try again. Get the shape (blue square) and look at the musical notes. There, that's better. Right, Left, Left, Right, Left, Right. It's a box with a big white diamond on it. Put in the colors as indicated by the diamonds on the shelf. Remember, they were yellow, blue, and yellow. Colorblind: from top to bottom (or bottom to top), two clicks, one click, two clicks. Get the shape (yellow triangle). Put the three shapes into the appropriate slots. Get the key. Use the key to open the door, silly! You need to shoot at the dragon in a particular order. keep track of how many stars of each color there are, as it will be useful later on! That little hiccup had me stuck for a few minutes. Duh. White Knight: I can't figure out what to do with the little crosseyed guy in my inventory. I've done everything else. Nevermind. I had another inventory item that I hadn't used yet. clerk in the hotel, to scare him away. In the 'kitchen view' where you can see the frog on the fridge, you can click on the room door to get an entrance way view. That might help you find something you're missing. I had no trouble with the grapefruit game but the other ones are giving me troubles today I don't know why the diamond one did because it's stuff i've seen before. The dragon one I'm having no luck with at all. There's only one house and I don't see any clues inside it. The cafe isn't a house. I'm stuck on White Night. I think I'm literally on the last puzzle too. My only usable item left is a red ball. I think I need to use it on that thing behind the hotel desk, but can't figure out how to get it to work. I mean, it's plugged in, but I don't know how to use the ball on it. You don't use the red ball on it. You use the red ball on something that looks like it, using it as a guide. Ooohhhh! Thank you, I got it now! the star puzzle is confusing. it shows red red blue red yellow yellow from left to right and a blue yellow blue diamond below. I don't know what's going on. Grapefruit and Three Diamonds were both easy little escapes. White Night is just frustrating. It's hard to tell what anything is because of the art, there are no labels, and no changing cursor. I'm about to just give up. You're suffering from information overload. The stars and diamonds are for two different puzzles, and you don't need to pay attention to the order of the stars, just how many of each there are. There are two steps. You will have to 'fix' an inventory item for it to work properly on the dragon. 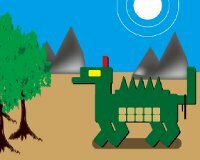 Secondly, note that the spots on the dragon's back form a 2x5 grid. There is one other place where you have seen a 2x5 grid. On the other hand, the over-simplified graphics make it fairly easy to notice out-of-place objects that need collecting. :) Hope this helps. Yes, before I quit, I had a fully functioning bow and a 2x5 grid clue that I could not decipher. From earlier comments, I knew that this clue coincided with the dragon. However, I do not understand the clue. The red baseball pointing to a certain button has no meaning for me whatsoever. I do appreciate your trying to help through hints and not actual reveals though. However, it's looking like I am a lost cause for solving it through that route. I still don't understand it. can someone post the solution? I've not had this problem with their Escape Man games, so I dunno. anyone? I need the solution to that puzzle if anyone has time. Oh man, sorry, replied to the wrong comment. Is your problem with how to use the basketball? You are supposed to go to the beginning view and throw the red basketball into one of the windows. If you are desperate for a solution, (it happens), do a search on you tube for a walkthrough for White Knight No 1 Game. Thank you for being the awesome community that you all are—it's super cool to see folks helping each other out! Much thanks also to Jonathan for the walkthroughs. Would anyone be willing to write up a walkthrough for White Night? Also, perhaps another walkthrough for Three Colored Diamonds Room that is more solution-explicit for those players who'd like more direct help? i think you are thinking of the white knight game which coincidentally doesn't have a walkthrough. 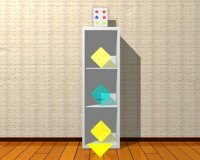 i need help with the 3 colored diamonds room. Okay, since I'm confused as to which puzzle you are referring, I will attempt to give you the solutions to both the star and diamond puzzles. When looking at the leftmost cabinet the scene right of the door, you will notice what is supposed to be a three-buttoned puzzle. However, the middle button is missing. You should also note the star symbol below the puzzle and the order of the numbers beside it. Okay, now let's try to solve this thing. Before you can solve this puzzle, you will need the missing blue button located under the blue couch. To get this button, you must open the middle cabinet in the scene to the right of the escape door and retrieve the rod which will be used to reach the blue button. Therefore, the blue button equals the number one, since there was only one blue star; yellow equals the number two; and red equals the number three. Our solution becomes: Blue, Yellow, Red, Yellow, Red, Blue. The cabinet is now open! Top: Pale Yellow, Middle: Light Blue, Bottom: Yellow. Good luck and I hope this helped you.